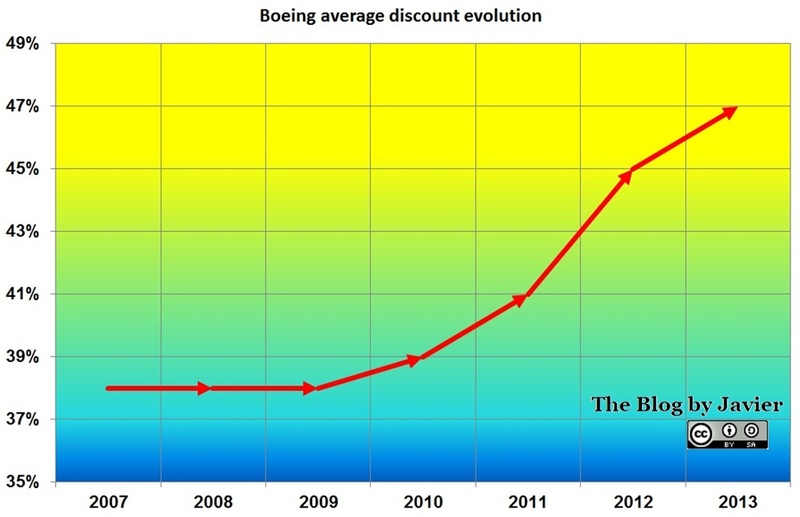 Last years I have published in the blog some posts (1) dedicated to show what was my estimate of the average discount Boeing applies to its commercial airplanes. I included in those posts the rationale used for the calculation. Find here the post related to the calculation of the discount based on 2014 data of Boeing Commercial Airplanes revenues, deliveries and list prices. 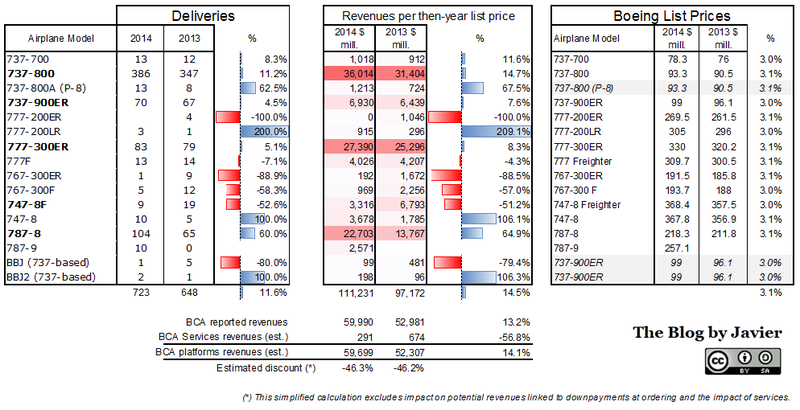 Boeing discount detailed simplified calculation: 2014 vs. 2013. In the table above, you may find for both 2014 and 2013 Boeing reported deliveries per model and Boeing published list prices per model (3) and Boeing Commercial Airplanes reported revenues. What is then estimated? Boeing Commercial Airplanes services revenues (these are deduced from financial reports reported information), Boeing Commercial Airplanes platforms revenues (derived from the previous figure) and the average discount; this is calculated from the difference between estimated BCA platforms revenues and what should have been that figure had the airplanes been sold at list prices. Results: average discounts of 46.3% in 2014 and above 46.2% in 2013, though nearly the same. (1) Find here what is becoming a “body of knowledge” on Boeing discounts: estimates calculated for 2014, 2013, 2012, 2011, 2010 and 2009; a review of the French portal Challenges.fr of aircraft discounts prior to Le Bourget airshow of 2013; aBombardier’s CEO statement on what is known in the market as the Boeing discount; Boeing Commercial Airplanes president Ray Conner speaking about the more aggressive pricing they are being forced to offer. Seeing the increasing trend of average discount together with knowing the fact that Boeing regularly increases list prices triggered the following question: Have Boeing airplane real prices increased, decreased or stayed constant in the recent years? I set out to answer this question using the estimated average discount of each year (1) from the graphic above. The Boeing list prices (LP) can be found here. I have been recording those prices for years and thus have a table with the evolution of list prices for each model year by year. The following step is to apply the average discount estimated for each year to then-year list prices, to get the estimated discounted prices (EDP) per model. Thus, a table can be built for the last 5 years. You can find below the result for the best-selling aircraft during previous years: 737-800, 737-900ER, 777-300ER and 787-8. Together these 4 models amounted 560 deliveries in 2013 or over 86% of the total 648 airplanes Boeing delivered in 2013. 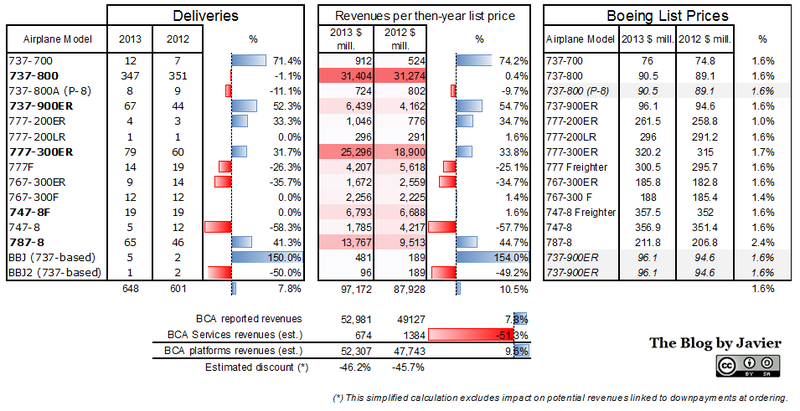 Boeing List and discount Prices evolution table, 2008-2013. The average list price increase included at the bottom line is computed with the information of all Boeing models (19 in 2008 and 18 in 2013, though different ones, a total of 24 different models along this period), not only the 4 included in this table. 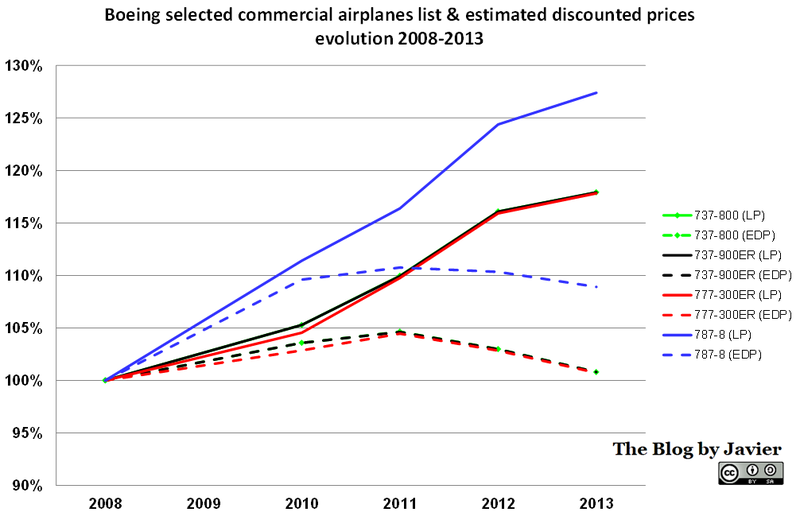 Boeing List and discount Prices evolution graphic, 2008-2013. Joe Nadol (JN) of JP Morgan: Is there pricing pressure? Ray Conner (RC): I think margin will be OK [for 737NG]. Some initial launch deals for MAX can be a little more aggressive, but we’re seeing that become more stable. JN: MAX–I thought pressure would be more on late NGs than on the MAX. RC: We were a little late getting into the marketplace with MAX and there was pricing pressure on NGs. We were about a year late so we were more aggressive than we would have been had we not been late. For the last years I have been trying to estimate averages for the discounts Boeing applies to its commercial aircraft using as departing information Boeing year-end financial results, list prices, net orders, deliveries and services revenues. You can see the results for 2012, 2011, 2010 and 2009. In each of the posts you can see a detailed explanation of the methodology I followed. Why do I comment this? Since 2009 I have noticed that the average discount has gone from ~38% (2009), 39% (2010), 41% (2011) to 45% (2012)!! The explanation I can find for that increase shall be linked the built-in penalties for 787 (net orders for 2012 being -12 a/c) and 747 delays (1 single net order) into revenues plus the launch of a new aircraft, 737 MAX (forced by A320neo sales success in 2011). How does it compare to Conner’s words?